JAN03 2318EST. Mellanox Technologies (MLNX), a semiconductor producer, dropped 17 percent today on a poor revenue outlook. The day's volatile intraday price action in MLNX exhibited an interesting conformity to a trio of price channels, which merits the stock's inclusion on these pages. Mellanox (MLNX). Thurs, Jan 3. 1-minute candles. The morning hours saw a vigorous advance by Mellanox, albeit after a colossal overnight gap lower, first within the bounds of a steep channel (in dashed green above), then within a somewhat shallower channel (in dashed red above). Breaks of both channels, highlighted above with a green and red circle, respectively, precipitated sharp declines of about a dollar. 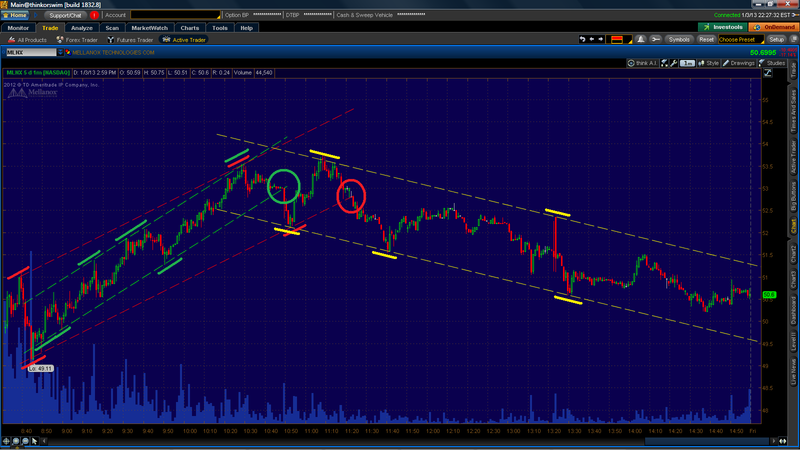 In the afternoon, meanwhile, MLNX drifted downward within a new channel, shown above in dashed yellow. Like its morning brethren, the afternoon channel was robustly defined; both the upper and lower boundaries coincided with multiple local price extremes, each highlighted by a solid yellow line. In sum, a small handful of price channels rather effectively models the intraday highs and lows formed by today's volatile price action in MLNX shares. Such is the broader promise of price channels: to effectively identify specific forthcoming support and resistance prices.